Hole number 6 is a tricky downhill par 4 of 265 metres. It is stroke hole 3 for men and 1 for women. From the No 6 tee, players generally use a wood or good iron to hit towards the base of the hill past the pine trees. The entire fairway on the left is flanked by conifers which are out of bounds all the way down. On the right of the fairway the pine trees are no longer out of bounds but it is no advantage to be among them. 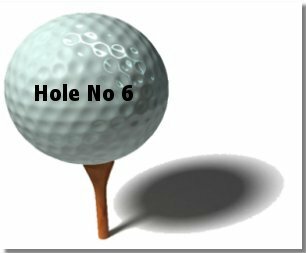 Accuracy is also the key to this hole as straying off the fairway in either direction will result in problems for the wayward golfer. In addition the fairway slopes to the left and will take any misdirected ball into the hazard of the pine trees before the hill. The green is small and sloping both to the left and right. This hole is relatively short but very difficult. In a southerly wind, some golfers are able to hit over the pine trees and onto the green, but that strategy can be disasterous if mistimed or inaccurate.